Commswise data cabling team are a leading structured cabling installer. We are a leading structured data cabling installer in the UK, providing a full range of data cabling services to clients throughout London, Oxfordshire and the surrounding areas. Here at Commswise, we pride ourselves on delivering work to the highest standard imaginable. All of our data cabling installations are carried out to industry standards and are fully guaranteed. If you scroll down to the end of this page, you’ll see more details on all three, along with their pros and cons. However, if you’d prefer to talk to us about your options, then we’ll be more than happy to converse over the phone or send more information in an email. We understand that choosing and installing structured data cabling can be very complicated, so we want to make the whole process as easy as possible for you. Labour costs for installation of Category 5e and Category 6 systems can be considered identical. It is therefore the difference in materials to consider. Currently the material cost differential for a 55 metre run of cable component cost (including data cable, module and patch panel) makes Cat6 £2.55 more to install than Cat5e. The inference therefore is for new installations to seriously consider the higher performance cable. 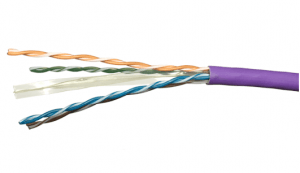 With Cat6A there are more difficult considerations. 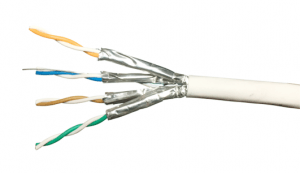 The additional screening on Cat 6A causes complications with respect to bend radius of the cable and fill ratio in duct & channel. This will have cost implications on containment design & provision. Termination is also on keystone jacks in both patch panel and module and can take 50%-100% longer. Materials are approximately double the cost of Cat 5 enhanced – so it can be seen that this system will be minimum 50% more. There are many things to consider – such as labour and material costs, the maximum cable distance, and the data transfer speeds. Don’t worry, one of our team members will help you make the right decision to suit your budget and requirements. Supports 10 Mbps, 100Mbps, 1Gbps data transfer (up to 100 MHz). Maximum cable distance 100 metres. Category 5e cable utilises only 4 wires in the cable. The Positive – Cost, smaller cable, can be split with cable economiser. The Negative – Doesn’t support 10Gbps, alien crosstalk. Supports 10 Mbps, 100Mbps, 1Gbps data transfer (up to 250 MHz). Maximum cable distance 100 metres. Cat 6 will also support 10 gigabit per sec up to 55 metres. Category 6 cable utilises all 8 wires in the cable. The Positive – Higher spec and performance than Cat5e, limited 10Gbps connectivity. The Negative – Stricter containment requirements, larger cable & more expensive than Cat5e. Supports 10 Mbps, 100Mbps, 1Gbps, 10Gbps data transfer (up to 500 mhz). Maximum cable distance 100 metres. Category 6 cable utilises all 8 wires in the cable. The Positive – True 10 Gbit/s connectivity, ideal for backbone infrastructure cabling. The Negative – Most expensive cabling, stricter containment requirements, larger cable. Why Choose Structured Data Cabling? Structured cabling is designed to help support and improve the performance of a cabling network. It can help bring multiple devices together, connecting phones to PC’s – and any other things that are part of the network. These days, it’s a very popular choice for companies all over the UK as they look to improve their communication. Less Downtime: When you opt for an unstructured data cabling network, then there’s a high-risk of experiencing faults, which lead to increased periods of downtime. This impacts your work, meaning productivity hits rock bottom. With our structured data cabling, you get a system that’s much easier to maintain and look after. Any faults can be pinpointed right away, meaning less time is spent doing nothing. Improved Communication Flexibility: Your comms infrastructure will become far more flexible with our structured network cabling. If new devices need to be added to the network, then this can be done with ease – without having to take the whole system down. It’s also far easier to move an entire network from one location to another, which is ideal when relocating offices. Save Money: It goes without saying that this type of data cabling will be more cost-effective than an unstructured offering. It’s cheaper to scale, and also helps consume less energy in your workplace, saving money there as well. Whether you need top-quality structured data cabling installation, or you require general data cabling maintenance; give Commswise a call today. Alternatively, contact our team with any questions you may have about our structured data cabling services. Interested in our Data Cabling services? How Do You Choose Your Perfect Business Telephone System? 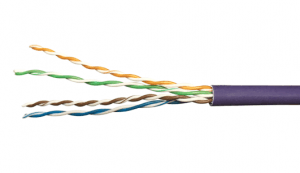 What is the difference between Cat6 & Cat6a?